Am abount to buy the audio adapter for using external mic. Since i vlog on mototrbike, i find the adapter brick pretty huge as already notice by all. Was wondering if its possible to use an extension cable with usb c type male female ports on either ends so that i can position the adapter a bit further away from the camera, like maybe at the back of the helmet. I, too, am looking for a vey flexible and lightweigh USB-C adapter cable for use with the ridiculously designed GoPro adapter. It is impossible to use the adapter with a gimbal mount. It is too heavy and the cable too rigid, If I can find a flexible adapter cable, I could put the adapter in my shirt pocket with no problem. From what I've read, if the extender is not too long it should work. All the extension cables I've found have been too stiff, and the gimble is not free to move properly. Yup, u are right, it does not work. I found out after ordering and extension cable and trying it out. So i guess we all are stuck with the brick. I've ordered an inexpensive digital recorder to use with the lavalier mic I bought. I don't need high quality audio, just ambient sounds, but with the gimbal it's quite impossible with just the GoPro built-in mics. I think if I give an audble start signal, both the GoPro and the pocket recorder will have a starting point, and I can fine tune it in post as necessary. 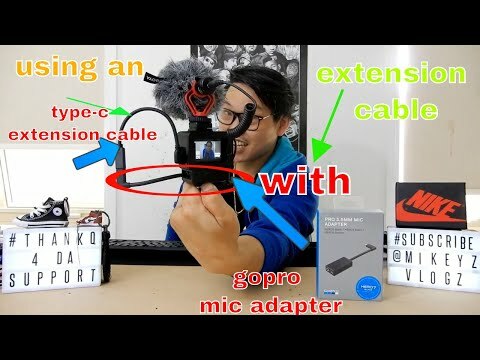 GOPRO HERO 5/6/7 BLACK USING A USB TYPE-C EXTENSION CABLE WITH MIC ADAPTER...IT WORKS!!!! !